Many of you have no doubt seen the postcards of Douglas Pratt at our postcard fairs when browsing through card boxes in your search for interesting topographicals of early Sydney. His postcards may not appeal to the “purist” collector of old postcards or the historical researcher, but I would suggest that you do not ignore them, as they do present a picture of a city which has changed dramatically since his works appeared. Douglas Fieldew Pratt was born in Katoomba, NSW, in 1900 at the manse of the Congregational Church, his father, the Rev.F.V.Pratt, being the resident minister. The family moved to Angaston, SA, in 1907. His first job was as a jackeroo on a country property near Singleton, NSW. It was here that he probably developed his love and affinity with the landscape. Moving on to Sydney he became a licensed surveyor in 1922 and married Phyllis Clark the following year. Later, in 1925, he worked as a detail surveyor for the Metropolitan Water, Sewerage & Drainage Board. A colleague at the MWS & DB, having seen some of his sketches, suggested he should develop his drawing and painting talents. Selling some of his paintings that same year encouraged him to study at the Royal Art Society’s drawing classes and at Sydney Long’s Etching School. His artwork covered all mediums – oils, watercolour, pencil, etchings. His first exhibition was held at the Macquarie Galleries, Bligh Street, Sydney in 1928. This was followed by exhibitions of his etchings and pencil drawings throughout Australia. Sydney, Melbourne and Perth have his works hung in their art galleries. During World War II, he served in the Australian Army (War Graves), serving in New Guinea; he attained the rank of captain. In 1953, he was appointed to the Commwealth Art Advisory Board, Canberra and served as a member until his death in 1972: he was awarded an OBE for this work. He also served as Vice-President of the Royal Art Society of NSW, of which he was a member for more than 20 years. Sir William Dargie wrote Pratt’s biography ‘ The Australian Artist Douglas Pratt’ “by order (request?) of the artist’s family”: it was published in 1975. There appears to be little other documention of his life. Although no mention of his artworks being reproduced in the form of postcards is mentioned in the biography, nor in any other articles that I have read, it would appear by the details that they were published about the 1930- 40’s. The cards present delicately drawn detailed pencil sketches, of Sydney, with his signature ‘Douglas Pratt’ in the bottom right or left hand corner. They were published by J.S.Pty.Ltd. and bear no reference numbers. The postcards are black and white letterpress production printed on inexpensive white board: size 140 x 88mm. Although most cards that I have seen have been unused, I do have two in my possession that were written on and dated 1944. Were these postcards available to the public in card racks or were they only available at art galleries ? I seem to remember seeing other postcards in the series – but that was before I started collecting them! Postcard prices generally vary from $1 – $4, but I have seen a few dealers charging $5 and $6 ! There are many picturesque locations around Sydney Harbour and it is perhaps no accident that South Head has received more than its fair share of postcard views over time. The topography lends itself to broad sweeping views of the Harbour and of the ocean. Here is a selection of views of this location which stress both the picturesque qualities of the site and also some historic elements. Sydney Harbour is actually a drowned river valley and this explains many of the physical features of the Harbour, its many sheltered bays and the depth of the water. South Head was a desolate location, the land rising rapidly from water level to a high point (over 350 feet/ 110m) near the location of the lighthouse, windswept, covered in low scrub and rocky outcrops and, until the development of ferry and tram services in the early part of the last Century, relatively inaccessible. Some of these qualities remain to this day. During the Golden Era of postcards prior to WW1 “The Heads” were the first feature and also the last feature to be seen as people arrived and departed Sydney by ship. Mass airline travel was an unimaginable development then. Few visitors arrive in Sydney now by sea and the visual impact of the yellow sandstone cliffs at first light of dawn is now reserved for a handful of privileged visitors on cruise ships. The commanding views from the site made it the natural place for crowds to assemble when great public events were taking place. The American Fleet visit of August 1908 was a case in point. 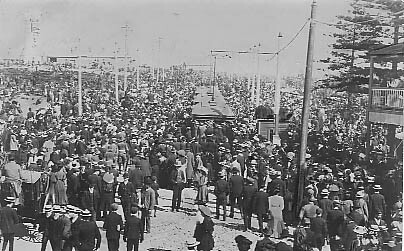 Crowds departing after arrival of American fleet August 1908. Lighthouse at extreme left. Trams are saturated with passengers. Other fleet visits by American and British ships were also witnessed by spectators at South Head. The military found the topography of South Head highly suitable for establishing coastal artillery batteries with interlocking fields of fire across the entrance to the Harbour. Remains of these batteries can be seen today. Other key man made features include the Signal Station and Lighthouse – these features too are prominent on postcard views. Trips to South Head and environs were once listed in the Trips Around Sydney booklet issued by the NSW Government Tourist Bureau. In 1912 for a 4d tram ride you could traverse some of Sydney’s most beautiful residential suburbs, visit the Ostrich Farm and inspect the Lighthouse (on production of orders obtainable at the Tourist Bureau ! ). The return journey could be made by ferry (from Watson’s Bay wharf) or tram. 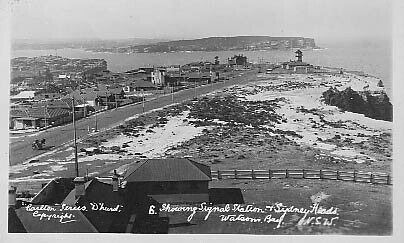 The tramway had been extended from the terminus at the Signal Station to Watson’s Bay in early 1909. The Ostrich Farm was established by a Mr Joseph Barracluff, one time Mayor of Waverley and noted tramway lobbyist in the Eastern Suburbs. The Farm was widely advertised in its day and cards of the business are relatively common in collections today. It was located between Old South Head Rd and Military Rd, Diamond Bay. Plucking a feather at the Ostrich farm. The New South Wales Government Tramways (NSWGT) operated from 1879 to 1961 and was one of the largest passenger transport undertakings in the English speaking world. This system of Sydney street railway lines grew during a 50 year expansion phase and was the product of the NSW Colonial, later State, Government. For most of its existence it was under the control of the Railway Commissioners of NSW. The Commissioners were charged with the responsibility of running the system as a business of the State. They did not have control of line development, this was the province of the Minister for Public Works and the Parliamentary Standing Committee on Public Works. Developmental lines, particularly those in the distant suburbs, were funded by the Works budget and several lines were approved in the full knowledge that they would not prove economic in the short term. Many of the lines established during the late 19th Century ultimately proved to be highly economic, eg the Bondi Line. This corridor remains to this day one of the most lucrative lines for street based public transport operation in Sydney and is one of the few corridors to operate at a higher frequency than during the first tramway era. The core of the system was known as the City and Suburban Lines . It radiated out from the heart of the City of Sydney on the southern side of the harbour. Another system known as the North Sydney Lines operated on the lower North Shore and several outlying isolated lines connected with the main railway system at the following stations -Parramatta, Arncliffe, Burwood, Sutherland and Camden. The City and Suburban Lines served the developing suburbs that formed around the City core. With technological progress they evolved from steam operation to electric traction during the first decade of the 20th Century. The first full time electric service was built along George St City and Harris St Ultimo. It proved remarkably popular and soon became saturated with peak period passengers destined for the main railway station, then known as Redfern, later rebuilt and renamed as Central (1906). The degree of overcrowding was such that a loop relief line to Central was opened in 1901 along Pitt and Castlereagh Sts. This line was to become arguably the most intensively used section of tramway in the world as it connected the busy ferry wharves at Circular Quay through the linear form of the emerging City to Central Station at the southern margin. From a tentative annual patronage of some 10m in 1903/1904, the Pitt and Castlereagh St loop grew to an astonishing 30m passengers per annum by 1931. This figure was obtained just prior to the opening of the Harbour Bridge which caused a reduction in ferry services to the Quay and consequent loss of patronage to the loop service. As line extensions developed into far-flung suburbs and the propensity of the population to use the trams grew, the City Lines ultimately became saturated. Saturation was notable prior to the First World War, but was not actively addressed by the State Government until the underground railway construction program of the 1920’s. The standard Sydney tram was an 80 seat vehicle known technically as an O or P class tramcar. During peak periods many of these vehicles operated as coupled sets (“double trams” to the public) and were crewed by two conductors and one driver. The crew pattern gave rise to an approximate operating staff to seated passenger ratio of 3:160 or one staff member to 53 passengers. A better ratio than is achieved by contemporary STA bus operations where the respective figures are 1:43 passengers for a standard Sydney bus. One of the more prolific Sydney photographic studios in the interwar years was Carlton Studios of Darlinghurst. At least 6,000 images of Sydney and suburbs appear on Carlton cards. A small selection of images follows. Carlton recorded events as well as popular locations and so the visual legacy of his work is strongly historic in nature. Like many post card publishers he returned to the same location over time to photograph and so the images also become an invaluable record of urban change. The period 1929-1935 is not accounted for in this reference work yet it is known that Carlton was active during this period as he photographed the introduction of new tram cars to the Sydney system in October 1933. 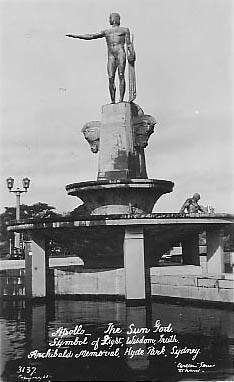 No 3137 Apollo statue Archibald Memorial in Hyde Park c 1932 ? 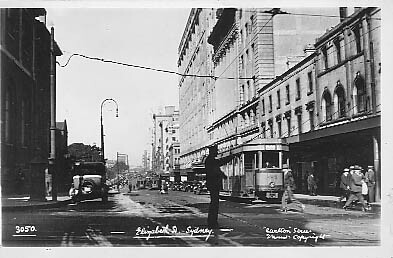 No 3050 Elizabeth St Sydney (showing a P class tram heading to Circular Quay). The numerical sequence of the images is not consistent as an image clearly taken near the completion of the Sydney Harbour Bridge has a very low number – 292. Many Carlton cards have handwritten text “Carlton series” ‘D’ Hurst” Sydney Copyright, in cursive form in the lower left or right corner of the image. Later cards (?) have an abbreviation to CC and many of the negatives appear to have passed to a company known as “Mowbray Series Scenic and Historic views” in the late 1930’s and post WW2 era. Many of the views appear as “sepia” (decomposing ?) images some are black and white. No tinted cards have been observed as yet. A variety of subjects and locations have been chosen to illustrate this article. Most of these tints from the pre WW1 era are highly saturated. Tinted photo postcard views of Sydney provide a window upon the past in a manner that is often striking to the modern eye. We are not used to viewing images of the past in colour. Especially the recent past just beyond living memory. Tinting is the application of colour by hand to the image during the development process. During the Golden Age of postcards (1900-1914) tinting was used in Sydney to produce a range of vibrant images, approximate visual reality and to differentiate postcard stock at retail outlets. During the pre WW1 postcard boom it provided employment opportunities in the many postcard companies that flourished in Sydney. A practice of colouring evolved where horizons were always tinted in a warm colour to suggest either sunrise or sunset. A spot of red was often employed to draw attention to a figure and occasionally photographer’s assistants were employed to deliver foreground interest and human scale to the image. Warm and cool colours were used and examples of both colour approaches using an identical image do exist. Tinted images were available in a variety of intensities. The more successful tints appear as light washes giving a rather de-saturated look to the image. A proficient colourist could select appropriate colours to wash onto the image in a way that made the result a convincing work by modern colour standards. Often the tints used were applied with a strong view to colour accuracy. Excessive tinting resulted in a more “psychedelic” look. When intense colour was used a less realistic image resulted, odd especially to contemporary eyes. Images that have chemically decomposed usually result in unusual effects and make for more abstract impacts. In many ways a well tinted image can be as effective as a modern colour photograph in conveying a sense of visual reality to a viewer. Colour images on cards in any form during this time were a rarity. The cards were small, portable “works of art” usually retailing for about 3d each. The equivalent of a tram fare from Bondi Beach to the City. No two tints for an identical image are the same. Endless variations ensure that collectors are often confronted with difficult choices whenever they buy examples ! Tinting was done on a production line basis and often young women were employed to perform the task. The mass production method used makes finding quality examples all the more surprising. The words of this colourist suggest that firms employing say 10 experienced staff could produce up to 10,000 images per week. (ie 170 per day per employee for a 6 day week). Central Railway Station with its slender clock tower has long been an iconic building in Sydney. Rooftop view from southern edge of city c1929. Carlton series. The station dates back to the Edwardian era when railway investment by the State Government was substantial and around 20 % of the entire state workforce was employed by the NSW Railway and Tramway Commissioners. Clock tower - incomplete c1920. PWF series. Original wooden booking hall 1906. The prominent position to the south of the city centre makes the structure highly visible from the Railway Square precinct and along the axis of Wentworth Avenue. View from Railway Square c1921. Opened on 4th August 1906 the building has been modified by the addition of extra levels (c1910) and the clock tower in c1921. First Locomotive at new station 4th August 1906. Anchor series. Central Railway Station - the main concourse. In October 1914 a passenger count at Central indicated an average of 85,000 arrivals per weekday, 93,000 on Saturdays and 40,000 on Sundays. Passenger train departure c1908. Cave/Hurley series. Unusual view of carriage storage area and watertank c1906. Perry. During this era railway and tramway passenger traffic in Sydney was increasing at roughly 13 per cent per annum. On a typical weekday some 55 trains departed during the peak hour – 5 to 6 pm. Central Electric Platforms Ticket Office c1926. 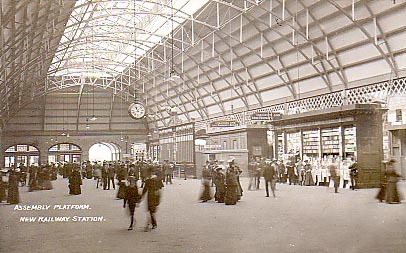 The assembly area - main concourse - in c1906. Passenger volumes through the facility remain impressive and the Station was once connected to the down town area by a tram service operating along Pitt and Castlereagh Streets to Circular Quay. Tramway colonnade outside the booking hall c1906. Kerry tint. Prior to the development of the underground railway from 1926 – 1932 the tramway service carried over 30m passengers per annum. Street level view from southern edge of city with policeman in foreground c1906. Anchor series card. In 1997 trams returned to the site with the introduction of the light rail service to Pyrmont – Ultimo. Night view Eddy Avenue Coronation lights 1911. I have been collecting Gilbert and Sullivan memorabilia since I joined the Sydney Gilbert and Sullivan Society in March 1969. The collection embraces an extensive range of media including books, scores, libretti, journals, periodicals , cds, videos and ephemera and I am delighted to say has been accepted by the Mitchell Library as a bequest in my will. It has been in the category of ephemera that I have developed my interest in collecting postcards of the London D’Oyly Carte Opera Company Gilbert and Sullivan principals. I would like to acknowledge an article by John Cannon and Brian Jones entitled ‘Gilbert and Sullivan Postcards’ from which I have borrowed freely. There have been a number of firms which issued cards of the D’Oyly Carte principals since the turn of the last century including, Raphael Tuck & Sons, Rotary, Beagles and Hill and Saunders. On the Australian front there are at least seven JC Williamson cards dating from about 1905 which were published with the imprint ‘Gilbert and Sullivan Opera Co.’ Artists depicted include Dolly Castles and Howard Vernon. But it is the collaboration of two of the choristers in the D’Oyly Carte Opera Company in the early 1920s, James Parkinson and H.R. Sleigh and their Parkslee Photographic Postcards, where my interest has lain. The main or ‘A” Series consists of 172 cards and a rarer “B” with non-consecutive numbers between B1 and B101. Within the “A” Series there are four unknown numbers; 118, 122, 123 and 142. The reasons for this are conjectural but may be attributed to the number being assigned to an artist who immediately or shortly after was replaced in a role or to the collaborators making mistakes in assigning numbers. Many of the cards have the spelling as Parksle which is more correct but not as easily pronounced as the other spelling. Most cards in the “A” Series show single artistes and they are mainly in costume but two are a ‘double’ and there are several of artistes off stage. Henry Lytton who was the principal comedian and a member of the company for 50 years figures prominently in the series with no fewer than 12 of the first 28 cards being devoted to him. His influence also extends to the back of cards where they are stamped with the following legend: “The Secret of a Savoyard by Henry A. Lytton. 6/- net, 6/6 post free. To make sure of a copy of the First Edition, write to the author.” This left very little space for any note to friends or relations. The collection is based on the publicity material supplied by the Company itself. Pre-1921 photographs are identical to the Parkslee pictures, but are not overprinted or marked out as a postcard. Some pictures have credits to other photographers – Bassano, Nunn, Hughes of London, Stuart of Plymouth and Paterson of Glasgow, being represented in the first 60 cards. The fascinating thing about collecting these postcards has been my inability to secure any within Australia. Attending the postcard fairs has resulting in seeing many postcards of the original Savoyards (that is those pre-dating the artists in the Parkslee Series), though not in costume from the operas, which tells me that there is a market for British theatrical postcards in Australia however, not one Parkslee has been unearthed. With my collection now numbering 119 there is an all-out search on. Kevin is desirous of winkling out any of the remaining postcards in the series that collectors or dealers may have and he may be contacted by e-mail to discuss requirements and negotiate prices.